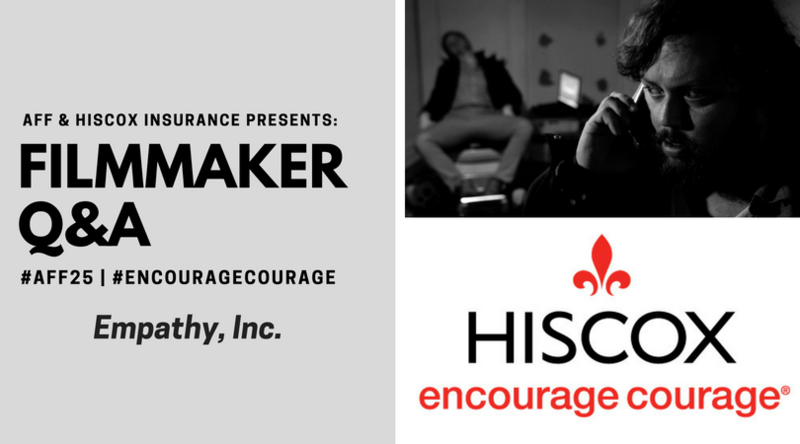 HISCOX FILMMAKER Q&A: EMPATHY, INC. The idea for Empathy, Inc. came from our desire to mix two genres: capitalist fable (Wall Street, Risky Business, The Social Network) with science fiction: an investor in a VR startup discovers that the reality the company provides isn’t virtual. Science is a paradox. It creates marvels that expand our humanity, but it also unleashes enormous power to dehumanize us. We wanted to explore this in the same way shows like Black Mirror and movies like Pi and Primer do. We were especially intrigued by the concept of empathy, both as a virtue and as something that could be exploited by villains in an entrepreneurial context. We relate to our main character Joel (Zack Robidas) through his virtues and flaws. For example, although he’s hard-working and clever and kind, he doesn’t know how to put others ahead of his personal success. He’s conflicted between the desire to achieve his dreams and his responsibility to his family and others. By extension, all the characters in the film occupy different points along the moral spectrum of how much they’re willing to sacrifice in order to succeed. This conflict is exacerbated by the technology at the heart of the story, which allows people to experience what it’s like to be other people. Not much changed once we finished our script. Sometimes we rewrote a scene or altered a location or action, but for the most part production closely followed our script and detailed storyboards. In the editing, however, we changed a lot. We cut some scenes that we realized we didn’t need, and, once our composer Omri Anghel completed the score, we realized we could cut and intercut even more. The final film is much tighter, faster, and more tense than the original script. Our tiny crew made courageous decisions every day—finding parking for a 12-passenger van in Manhattan, lifting our 500-lb. props up and down flights of stairs, hustling to get locations and catering expenses down, etc. Our actors also acted courageously throughout the entire shoot. Since our story relies on individual actors portraying multiple characters, the level of emotional commitment and dynamic range of our actors… we simply have no words to describe. It’s right on the screen though. Our actors are by far our most spectacular special effects. The overriding risk of production was that our story was too complex for us to pull off, or for audiences to appreciate, so going in we had no idea if we were going to end up with a mess. All we knew is that we liked the script and that everyone we showed it to wanted to be a part of it. The act of filmmaking itself is a massive risk of time and money, so we had to adopt a “have fun and see what we learn” attitude to mitigate the fear of failure. We had faith that if we had fun and tried to learn from every roadblock we encountered, we’d end up with something better than our previous film. We were lucky to end up with something special. Our black-and-white sci-fi thriller was influenced by film noir generally and has a smattering of Hitchcockian and Lynchian moments. The sci-fi element was hugely influenced by Darren Aronofsky’s Pi, and Shane Carruth’s Primer. But in truth, all these elements are probably just faint influences. What we ended up with feels uniquely nostalgic, retro-futuristic, and disturbingly modern. In the simplest sense, the risk is the cost of production. Then there’s the 2-plus years of working full time to make the film, plus all the time it takes to promote it. There’s also an emotional risk. Every cast and crew member put their soul into the production without knowing how successful the final product would be. Artistically, we shot in black-and-white, used an unconventional structure, and dived head-first into a complex theme. We could have made “less risky” choices, but that would’ve involved an even bigger risk—the risk of making something people had seen before. We wanted to make something no one had seen before. Anyone with a smartphone can make a short film right now, and anyone who has a pen and paper can write a script. If you want to become a filmmaker or screenwriter, start making something, and make it not in order to succeed, but in order to see what you learn. If you focus on learning, you can manage the anxiety that is the price of any worthwhile risk. Write. Shoot. Share. Reflect. Repeat. They’re all important, but Reflect is the one that reduces anxiety, and allows you to repeat the process with less fear because you know you’ll learn something. Then you just scale up incrementally as you improve. Good luck.